Η Toyota στην έκθεση της Νέας Υόρκης θα παρουσιάσει το Highlander MY2017. Το μοντέλο αποκτά νέο 8άρι αυτόματο κιβώτιο ταχυτήτων το οποίο αντικαθιστά το 6τάχυτο αυτόματο κιβώτιο, που συνδυάζεται με τον V6 3,5-λίτρων κινητήρα. Διαθέσιμος είναι επίσης και ένας 2,7-λίτρων τετρακύλινδρος κινητήρας που συνεργάζεται με ένα 6-τάχυτο κιβώτιο, με την κίνηση να περνά στον μπροστά άξονα, ενώ το υβριδικό Highlander προσφέρεται με CVT κιβώτιο και σύστημα τετρακίνησης. Στιλιστικά το Highlander MY2017 διαθέτει νέο μπροστά προφυλακτήρα, νέα πίσω φωτιστικά σώματα, νέα διακοσμητικά, νέες ζάντες, νέα μάσκα ενώ εξοπλίζεται και με τα συστήματα αυτόματου φρεναρίσματος, ειδοποίησης αλλαγής λωρίδας κυκλοφορίας, αυτόματης μεγάλης σκάλας, αυτόματου φρεναρίσματος και ενεργού cruise control. TORRANCE, Calif., March 14 – – Toyota will be debuting the significantly enhanced 2017 model year Highlander mid-size sport utility vehicle (SUV) on Wednesday, March 23 at the upcoming New York International Auto Show. The popular Highlander, receives an array of new and updated equipment and technology, inside and out, including a new Direct Shift 8-speed (8AT automatic transmission). Highlander is a no-compromise mid-size three-row SUV that brings together the best in style, technology, comfort, capability, and safety. Its exterior design conveys both refinement and strength, which complements a refined interior that sets a high bar in its segment. The third-generation model, now entering its fourth year, offers room for up to eight, a choice of three powertrains and six model grades, including a new sporty SE model. The Highlander Hybrid adds two new grades, (LE and XLE) to its existing lineup of Limited and Platinum models for a total of four. 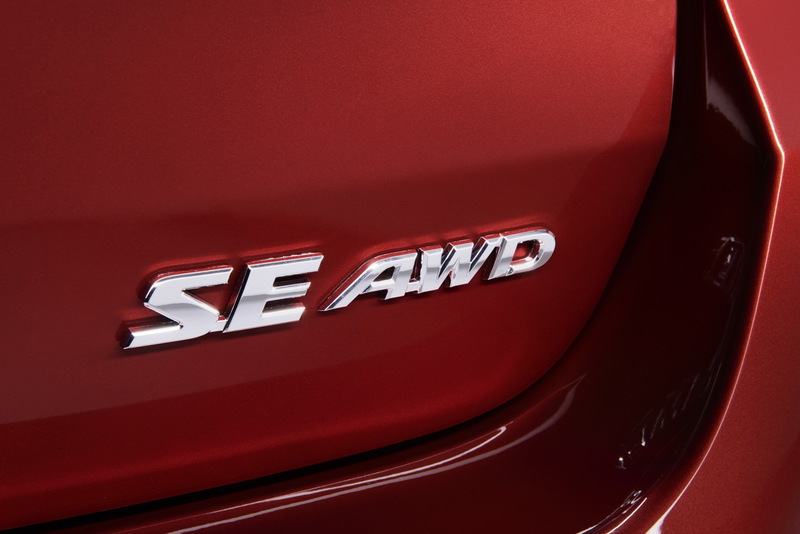 All Highlander Hybrid models will continue to be all-wheel drive (AWD). The six Highlander gas models will continue to be (LE, LE Plus, XLE, SE, Limited and Limited Platinum) available in both front-wheel and AWD. It all adds up to the ideal family vehicle. Performance will be enhanced in the 2017 Highlander gas models with the addition of the new Direct Shift 8AT (automatic transmission) that will be paired with a new 3.5-liter V6 Direct Injection Engine. The new transmission is more compact and will provide more transmission efficiency through its 8-speed gear range. 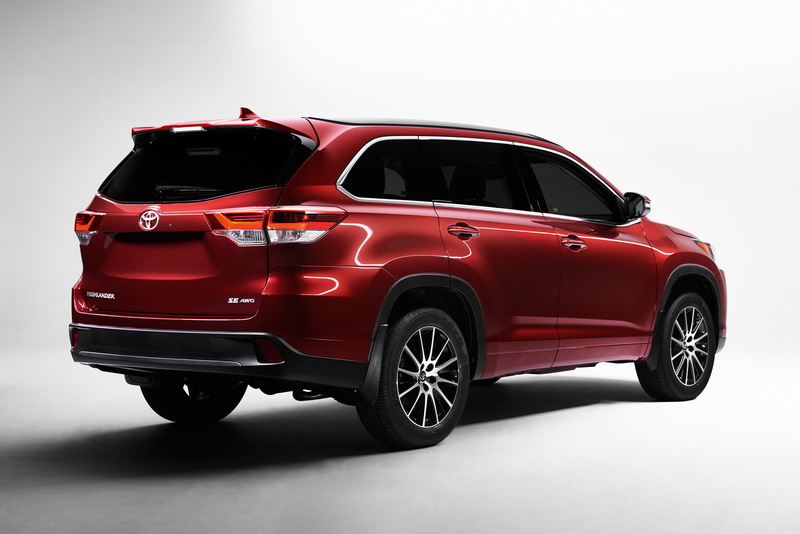 The 8AT (Automatic Transmission) will be standard on all V6 Highlander gas models. 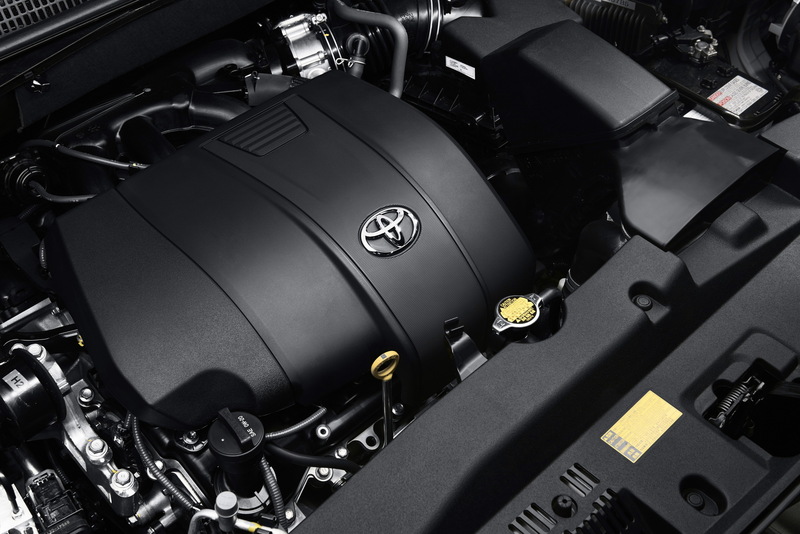 The new 3.5-liter Direct Injection V6 Engine will be available on all Highlander gas models and standard on all Hybrid grades. The new engine will generate significantly more horsepower, provide enhanced fuel efficiency, and deliver a more direct driving feel by expanding the lock up range. In addition to Highlander, the new Direct Shift 8AT (automatic transmission) and 3.5-liter V6 Direct Injection Engine powertrain will be equipped in the 2017 model year Toyota Sienna van. In an effort to help conserve fuel, Highlander V6 models (excluding LE) will come standard with a new Stop and Start Engine System (S&S). While driving the Highlander, the S&S allows the engine to shut off when the vehicle comes to a complete stop and restarts when the driver lifts their foot off of the brake pedal. The standard powertrain on Highlander 4×2 LE gas models will remain the 2.7-liter 4- cylinder paired to a 6-speed automatic transmission. All Highlander Hybrid models will continue to receive the electronically-controlled continuously variable transmission (CVT). The 2017 Highlander and Highlander Hybrid will receive tasteful styling enhancements that will continue to turn heads. The changes start with a new upper and lower front grille design for all grades. Each grade will be distinguished by different grille finishes that will also carry into the headlamp housing. The grille on all LE, LE Plus and XLE grades will receive a silver painted finish, while Limited and Platinum grades will receive a painted chrome finish. From behind, the rear taillights will receive a sleeker redesign. A chrome trim garnish will also be added on the rear bumper of Limited and Platinum models. Highlander will receive three new exterior colors, including Celestial Silver Metallic, Toasted Walnut Pearl, and, exclusively on the new SE, Salsa Red Pearl. Interior updates include a new brown leather interior that will be available on the Limited Platinum grade. Charging personal devices will be more efficient as all Highlanders will add four USB ports for a total of five. For those looking for a Highlander with all the bells and whistles but require added passenger seating, the premium Limited and Limited Platinum grades will offer buyers the choice of second-row captain’s chairs (providing seating for seven), or second-row bench seats that will expand capacity to eight people. 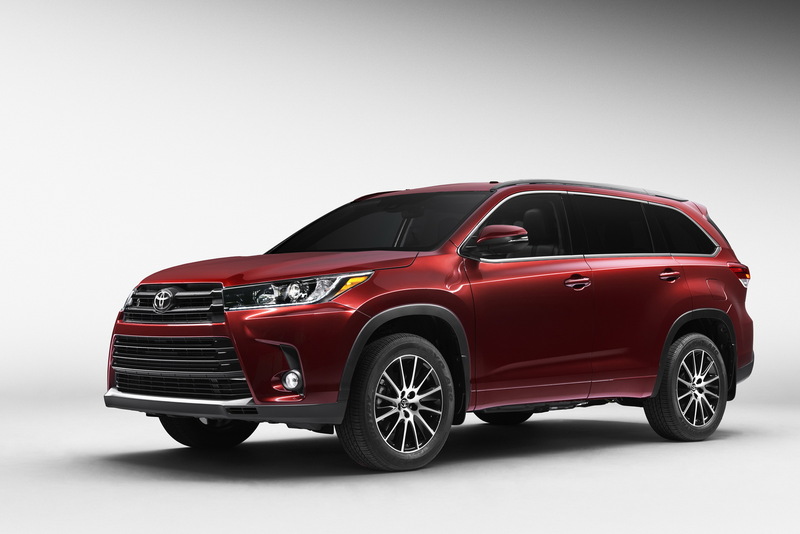 The 2017 Highlander will come standard with Toyota Safety Sense P (TSS), a new multifeature advanced safety package anchored by automated pre-collision braking. TSS bundles cutting edge safety technologies including Pre-Collision System (with Forward Collision Warning and automatic emergency brake), Lane Departure Alert, Automatic High Beams, Pedestrian Pre-Collision System and Dynamic Radar Cruise Control. The Pedestrian Pre-collision System (PCS) uses a camera and radar to detect objects ahead of the vehicle. When the system determines there is a possibility of collision it prompts the driver to brake with an audio and visual alert. If the driver notices the hazard and brakes, the system provides additional braking force. If the driver fails to brake in a set time, the system automatically applies the brakes, reducing speed in order to prevent or mitigate the collision. Lane Departure Alert (LDA) uses a camera to detect visible lane markings. If the system determines that the vehicle is starting to deviate from the lane, LDA alerts the driver and will provide steering assist to help get the vehicle back into its lane. Automatic High Beam (AHB) helps enhance forward visibility during nighttime driving. It uses a camera to detect the headlights of oncoming vehicles and the tail lights of vehicles ahead, and then automatically switches between high beams and low beams so as not to dazzle other drivers. The Highlander XLE grade will also adopt blind spot monitor as standard equipment. To help make parking easy and safe, the 2017 Highlander Limited Platinum grade will come standard with a Bird’s Eye View Camera with Perimeter Scan. This Toyota technology employs four cameras that are mounted on the front, the side mirrors and rear of the vehicle to project a panoramic view of the vehicle’s surroundings on the central touch display monitor. The system offers drivers assistance when parallel parking, and when pulling in and out of parking spaces. The Bird’s Eye View Monitor system also debuts a Toyota-first feature called Perimeter Scan, which provides a live rotating 360-degree view around the vehicle, helping the driver to see potential obstacles. Toyota Motor Manufacturing, Indiana (TMMI) in Princeton, Ind., which employs over 4,000 American workers, assembles all Highlanders and exports them to 12 countries. The 2017 Highlander and Highlander Hybrid will begin arriving at Toyota showrooms in the fall of 2016.